20 classic jazz albums from the iconic label at a great price! To a whole generation of listeners, the name Atlantic actually means Atlantic Jazz. From the mid-1950s, the label founded in 1947 by Ahmet Ertegun and Herb Abramson started a separate series to embrace what was then called “modern jazz”. Joined by Ahmet’s brother Nesuhi in 1955, they brought the label into the 12-inch LP market, and built up a whole new roster. Over the next two decades, they released some of the most important jazz albums ever made: John Coltrane’s Giant Steps, Charles Mingus Blues & Roots, the Modern Jazz Quartet’s Pyramid, Billy Cobham’s Spectrum, and many more. 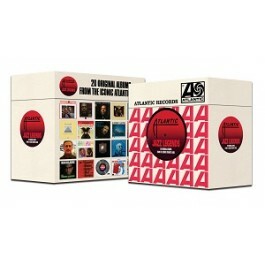 This box set is a celebration of jazz on Atlantic, in 20 CDs. 20 original albums, packaged in their vinyl replica sleeves with spines and labels. 28-page colour booklet with musicians’ line-ups and liner notes. Some of the best albums made for the labels, from classics by John Coltrane, Ornette Coleman, Charles Mingus and Billy Cobham, to rarities like Joe Mooney’s Lush Life, and Dave Pike’s Jazz For The Jet Set. All this at a great price!